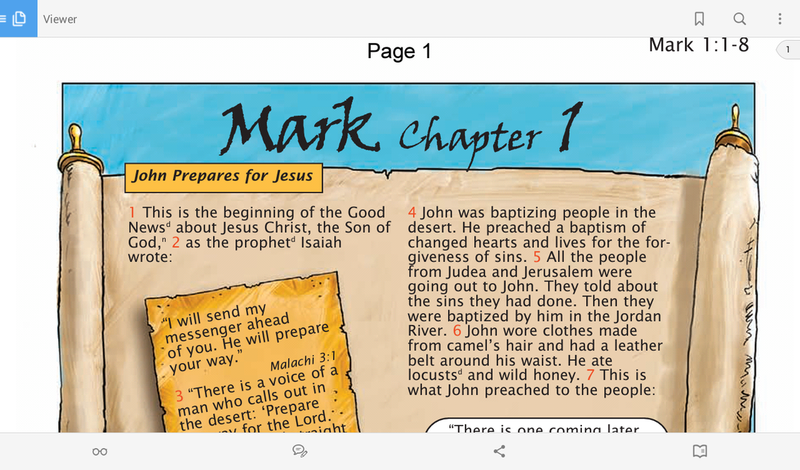 The products put out by FREEillustratedBible.com are PDFs (for e-Books) and M4Vs (for e-Movies), fairly universal formats which you should be able to view and use on your devices, but we know getting started can be frustrating, so we've put together some information on how to do so. Please keep in mind that due to the enormous variety of devices, operating systems, and software, no guide will be comprehensive enough to cover every configuration. There are several ways of getting your files onto your mobile device. For small files, you can email yourself the file as an attachment and open it on your device. For larger files such as those you receive from us as downloads, either (1) use the initial email or webpage download links to download them directly onto your device, or (2) connect your device by cable to the computer and manually move the files over , or (3) use an available file-sharing option or cloud service, many of which offer free plans. Be aware that we offer "LG" (Large) files for large screens and "sm" (small) files for small screens like tablets and phones. When you purchase a download through our website you will see a confirmation page where you can immediately download your file using the blue link. Access this page on your desired device, or open the confirmation that is emailed to you on that device, and click the link. The file will download onto whatever device you are accessing it with. Use a compatible cable to connect your device to the computer and follow the instructions of your manufacturer to access the files on your device. Copy the file on the computer and paste it somewhere you will remember. Using either a built-in file-sharing utility or a “cloud” service, upload the file from one device so that you can access it on others. Use the same service on your mobile device to locate the file. There are a number of cloud services with free plans available, including the following. Many devices claim compatibility with the M4V format; the stock player in Android supports it, and iPhones support M4V. If a device is not playing it, try changing the extension at the end to ".mp4" instead of ".m4v" and see if that resolves the issue. (1) Using a file manager application, navigate to the location of the file, open it, and then choose to use Adobe Acrobat Reader when you see the popup. (2) Open Adobe Acrobat Reader, select the "LOCAL" tab at the top, and look below to find the file. If the buttons disappear as you browse around the page, just tap once on the document to make them reappear. Clicking this bookmarks the current page. Clicking again deletes the bookmark. Search the document for a specific word, phrase, number, etc. This is where additional options appear that aren't visible as buttons, such as "Print" and "Settings"
Clicking this and typing in a number allows you to jump to a selected page. Choose how you want to view the PDF - as a continuous page, one sheet at a time, two sheets at a time, etc. Click on this to open the options to make comments and marks on the document. To exit this mode, go to the upper-left corner, click the yellow box, and select "Viewer"
Click on this button to view sharing options. Click on this to view the Table of Contents or the Bookmarks. Additionally, you can quickly advance to the next page or move backwards to the previous page by tapping along the side of the page in the direction you want to go. For instance, tapping about midway along the right border of a page should move you to the next page.